“A Message for the Human Race”: an illuminating book for understanding the spiritual. 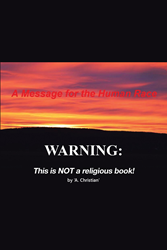 “A Message for the Human Race” is the creation of published author A. Christian, the pseudonym of a devoted servant of the Lord who has taken his wide-ranging self-education into his own hands to sharpen and prepare his mind for the truth. Published by Christian Faith Publishing, A. Christian’s new book is a tremendous work of honest intellectual and spiritual effort that nonetheless steers clear from falling into the trap of believing any one mortal can fully understand and express all that God is. Firm in the understanding that God reveals just enough, and that one should never hinder their experience of Christ with a surfeit of knowledge, Christian encourages fellow believers to join him on this journey to insight, made plain to all with eyes to see and ears to hear. View a synopsis of “A Message for the Human Race” on YouTube. Consumers can purchase “A Message for the Human Race” at traditional brick & mortar bookstores, or online at Amazon.com, Apple iTunes store, or Barnes and Noble. For additional information or inquiries about “A Message for the Human Race”, contact the Christian Faith Publishing media department at 866-554-0919.